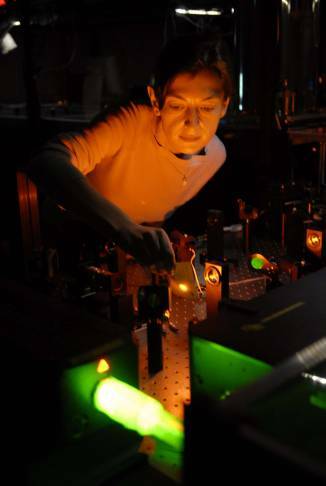 Optical microscopy is an indispensable tool for cell biology. Different microscopy methods are currently available and continuous effort is devoted to develop new techniques with improved sensitivity, selectivity and/or spatial resolution. An important issue in recent microscopy is the ability to perform non-invasive studies, i.e. avoiding the need for fluorescent probes that are prone to photo bleaching and can perturb the cell functions. 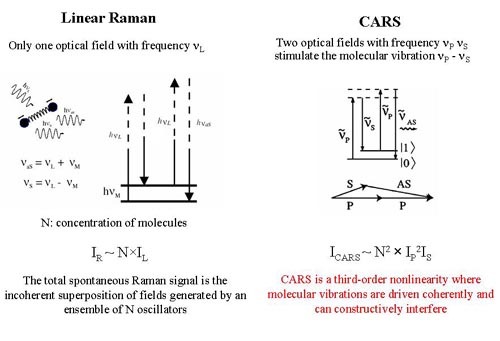 The research plan is to develop a new generation of laser-scanning multiphoton microscope based on Coherent Anti-Stokes Raman Scattering (CARS, see figure below) with improved sensitivity and chemical specificity for real-time studies on living cells. Such an instrument will allow non-invasive microscopic examination of cells and subcellular structures under physiological conditions without the need to stain or express tagged proteins.